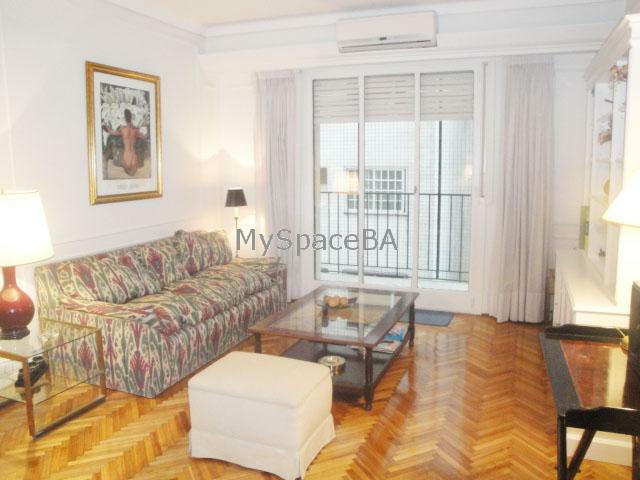 Very nice, bright and very silent two bedroom apartment located in Recoleta area, situated at the back of a very good building. The apartment offer an ample living with a comfortable sofa , dinning area with a glass table and chairs . The main bedroom has a Queen size bed , Tv with cable . Aircon . The second bedroom has two single beds . Cealing fan . There are two bathroom : one complete with bathtube and shower and the other one with shower. Also there is a third room or study with a desk for computer. Fully equipped kitchen with breakfast area. Two bedrooms , two bathrooms , very silent . Aircon . Heater . TV with cable . Internet . Wi Fi. Safe box. Closets . Kitchen with fridge , freezer , microwave . Gas range . Oven . Dishes . Washing machine . Toaster . Coffe-machine . Downtown , Recoleta Cemetary , Cinemas , banks . Restaurants . Bars . Residential area. Comercial area. Subway . Bus routes .